At 14 minutes past midnight on July 30, she was struck on her starboard bow by two Type 95 torpedoes from the Japanese submarine. The explosions caused massive damage. The Indianapolis took on a heavy list, and settled by the bow. Twelve minutes later, she rolled completely over, then her stern rose into the air, and she plunged down. Some 300 of the 1,196-crew members went down with the ship. With few lifeboats and many without Lifejackets, the remainder of the crew was set adrift in the Philippine Sea. In the dead of night they were plunged into the open ocean battered, wounded, burned, covered in oil, having watched many of their shipmates die, barely surviving themselves, and scared beyond comprehension. The light of dawn only confirmed the gravity of their situation. They would be rescued once they did not arrive in the Philippines as scheduled that morning. However, the USS Indianapolis’ mission was still covert. The remaining crew of USS Indianapolis was left in the open ocean, alone. The Philippine Sea is inhabited by mako sharks, blue sharks, oceanic whitetips and silky sharks. All are known to be opportunistic and aggressive feeders. The sharks began eating the dead on the first day. They seem to appear greater numbers late in the afternoon. In the quiet stillness of the night, survivor accounts recall hearing a scream off in the distance that meant someone was being attacked. The sharks had begun to take the living. Although the USS Indianapolis (CA35) died at sea, the memory of her crew lives. 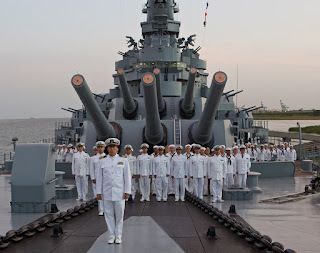 Through the efforts of the USS Indianapolis (CA35) Second Watch, the memory of the Indianapolis will be preserved; her history, story, feeling and experiences shared. The Second Watch became an instrumental part of the project, providing historical facts, records and photos from survivors and their families. Most importantly, they provided a connection to survivors still living. Richard P. Stephens, was the other living survivor that traveled to Mobile where the filming took place. Seizing the opportunity of an open bench seat, Cage sat down with Stephens as though he was chatting with an old friend. In retrospect, Rionda Del Castro felt the entire experience of writing, producing, editing and selling “USS Indianapolis: Men of Courage” was an enormous endeavor. “However, nothing compares to the real crewmembers plight. The horrors of what they went through, all of them, survivors, those lost at sea, and their families. To welcome them to our set was a privilege. I am producing a beautiful film with everything I have. 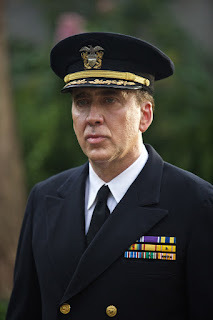 Our desire was to make the final crew of the USS Indianapolis proud.” says the passionate French producer. 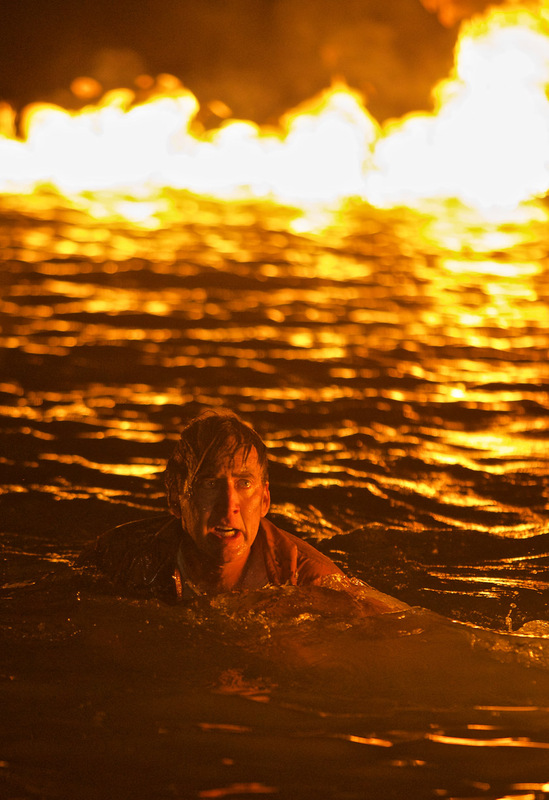 “USS Indianapolis” opens August 24 in cinemas from Pioneer Films.